Last night’s jam started at 9pm with members of the house jam band (who give up their spots to other musicians who come in after the first set) and last night they included Johnny Vernazza on guitar, Victor Marquez on guitar, Jim Reeves on bass guitar, Matt Taylor on drums, Tim Sutherland on keyboard, Chuck Arcilla playing the sax, Lampchops (Carlos Serrano) on trumpet and Phil Lozano on trombone. Most of these guys have their own bands, and you can find them around town on other nights. In this clip, Victor Marquez takes the lead with BB King cover song Why I Sing the Blues. And in this clip, Johnny Vernazza leads and sings Buddy Guy’s cover song Talk to Me Baby. 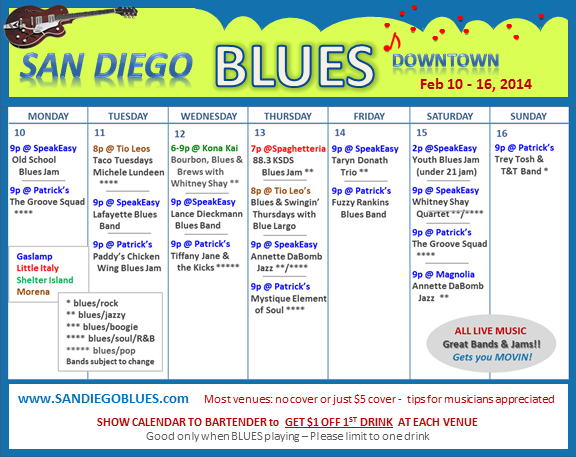 In addition to what’s on the calendar this week, there is the weekly jam at House of Blues on Wednesdays 7-11pm. Hope to see you there! Victoria Wasserman belts out cover song Me & Bobby McGee at the HOB Blues Jam this past Wednesday night. She’s accompanied by Jacinto Castaneda and Dave Keefer on guitar and Pat Kelley on keyboard. Not sure who was on drums or playing the bass. Wednesdays are one of my favorite blues nights of the week and usually starts at the JammingOut (www.JammingOut.net) and BLUSD (www.blusd.org) blues jams on the free stage at House of Blues. Last night was a full house of musicians who got up to play throughout the evening and an audience of locals and visitors. Christine Gilardi took the lead and rocked the house singing and playing guitar to the great Etta James cover song The Sky is Crying in this video. She is accompanied by Neil Jones on lead guitar, Junya Isogawa on guitar, Kevin Cooper on bass and Rene Wooley on drums. We don’t hear reggae too often at this jam, but Rosalie Thomas showed up with her steel drums and delighted us with the UB40 cover song I Want to Make You Sweat. Also on stage was Michael Minor on drums, Kevin Cooper on bass (and vocals) and Ray Zvetina on guitar. 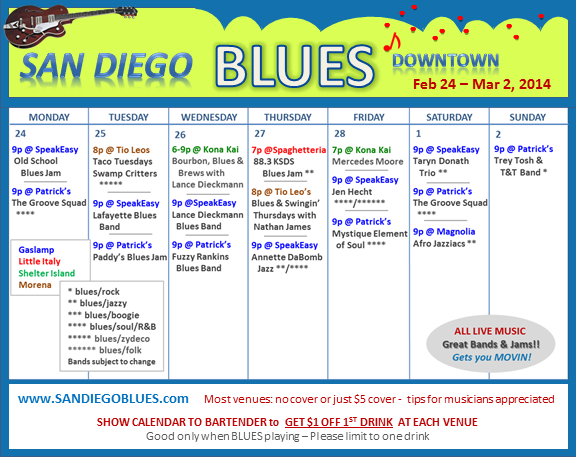 This week we have another good line up of blues jams and bands around town. In addition… at the House of Blues, Lafayette Blues Band will be playing Thursday night 7-11 and the weekly Wednesday night jam is also happening there from 7-11. Hope to see you there! 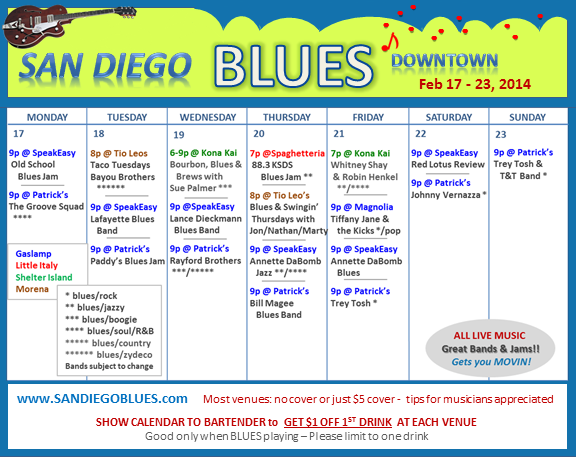 This week there is a good line up of blues all around the downtown area, and most of it is in the Gaslamp. Tiffany Jane is new to me, and I’m not really sure how to peg her blues sound, so I’m going with her blues/pop listing. She sounds more like Amy Winehouse or Norah Jones to me, so not quite sure that is really blues. Let me know what you think. There is also a full week of jams to check out. Monday at SpeakEasy, Tuesday at Patrick’s, Wednesday at House of Blues free stage 7-11 (not on schedule since don’t offer discount), Thursday at Spaguetteria, and Saturday afternoon at SpeakEasy with young adults who are really talented and great blues musicians.